This Central Constancia is not to be confused with the Central Constancia of Ponce of which no remains are left and of which you can read on the PR Sugar Mills page. According to José Ferreras Pagán in his 1902 book Biografia de las Riquezas de Puerto Rico , Central Constancia was owned at the time by Gerardo Soler. His descripion of Constancia stated in part; "This property was a muscovado sugar factory since 1867 and grew into a central in 1891 with all its machinery finally installed in 1897. It consists of 900 acres of land of which 450 are planted with sugarcane...its administrator is Rafael Palacios and its factory and lands are represented by Francisco Arrieta..."
Though in Spanish, the document La Central Constancia y el Desarrollo Historico de la Industria Azucarera en Toa Baja provides an interesting history of the early developments of this sugar mill. Per this document, Hacienda Constancia was established in 1854 when Miguel Arrechea acquired Hacienda Santa Rosa, Estancia Ahoga Perros and a parcel known as Honduras from Ramón Salgado and combined them into one. In1857 Arrechea sold 1/2 of Constancia to the firm Soler, Massó & Vias whose partners were Gerardo Soler Macaya (1797-1871) a Spanish immigrant from Barcelona, Manuel Massó Ballester (1779-1878) a Spanish immigrant from Barcelona who died without ever marrying and without children and Juan Vias Paloma (1814-1866), a Spanish immigrant also from Barcelona. Other sources state that the owner in 1867 was Secundino Lozada which appears to be in error. Manuel Massó Ballester and Juan Vias Paloma were friends from the town of Sitges in Catalonia from where they emmigrated to Puerto Rico in 1840. Soon thereafter, they established a very successful mercantile firm in San Juan. In 1852 Vias Paloma married Isidora Paula Ochoteco Monclova from which marriage four children were born. Manuel Massó Ballester left all his inheritance including his ownership in Hacienda Constancia to the widow of his friend Juan Vias Paloma who had died in Barcelona in 1866 and her four children. 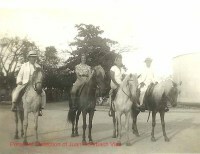 This information and the picture below of four persons on horseback, is the courtesy of Juan Rohrbach Vias the 2nd great grandson of Juan Vias Paloma. In 1880, Constancia's owners were the heirs of Manuel Massó Ballester and Juan Vias Paloma; Manuel, Catalina, Juan and Julio Vias Ochoteco as to 2/3, and the heirs of Gerardo Soler Macaya; Gerardo Soler Calzada (1834-1907) and Rosa Soler Calzada who having died in 1868 left her participation to her widower José Echeveste Arrazain, a Spanish immigrant from the Basque Country, and their daughter Rosa Josefa Echeveste Soler as to 1/3. Most of these lived abroad, therefor, since the 1880s the administration of Constancia and its development into a central sugar mill was the responsibility of local resident Gerardo Soler Calzada who is often times attributed 100% ownership incorrectly. This edict in the August 10, 1907 edition of La Democracia newspaper, verifies that the owners still at that time were Rosa Echeveste and the mentioned above heirs of Manuel Vias Ochoteco among others since the edict does not include at the time owners who lived in Puerto Rico. In 1911 Rafael Fabian Fabian, a Spanish immigrant from Asturias who also had ownership interests in Roig , Cortada , Pasto Viejo and Coloso , acquired ownership interest in Constancia when he purchased then Spain resident Rosa Echeveste Soler's interest. He soon transferred his ownership to the Corporación Azucarera del Toa in which he had a participation interest together with the heirs of the Vias and Soler families and Sosthenes Behn who was secretary. In 1930 the admisnistrative staff of Central Constancias was: Manuel Margarida Jr., Administrator; Manuel A. del Valle, Factory and Field Superintendent; M. Vazquez, Engineer; and J. Villamil, Manager. Its Officers and Directors were: Rafael Fabian, President; Manuel Gonzalez Martinez, Vicepresident; José Rodriguez Ante, Secretary; José M. del Valle, Treasurer, Emilio S. Jiménez, Rafael Martinez Dominguez and Oscar Nevarez, Directors. On June 1, 1938 El Mundo Newspaper of San Juan published an edict signed by Alfonso Vazques Cabañas, Corporate Secretary of Compañia Azucarera del Toa, notifying that six stock certificates for a total of 720 shares of common stock of Corporación Azucarera del Toa issued to Juan Francisco Vias Ochoteco and Amalia Torrijos Lacruz were destroyed in a fire at the Covento de las Escualas Pias de San Fernando in Madrid . This is evidence that in 1938 some of the heirs of Juan Vias Paloma who resided in Spain, still maintained ownership interest in the sugar mill. Constancia was severely damaged by Hurricane San Felipe of 1928, we understand the structures photographed are part of those rebuilt after the hurricane. What seems to have been used as the sugar mill's office building and the warehouse building running along the right side of the pictures below, are currently being used by Trigo Hermanos, a local wine & spirits manufacturer. In 1944 Constancia was subject to a suit brought by the Government of Puerto Rico because of its land ownership in excess of 500 cuerdas, the excess land was acquired by the Land Authority of Puerto Rico. Constancia ceased operations in 1962 just six years after its best production year. After it shut down, it was dismantled and its machinery sold to Central Risaralda in Colombia.